This morning’s 6-3 opinion in Air and Liquid Systems Corp. v. DeVries affirms the decision of the lower court holding that the manufacturers of asbestos-dependent equipment used on Navy ships can be held liable to sailors who became ill because of their contact with the asbestos. Because the case involves liability for conduct at sea, the dispute arises under the “maritime law,” a type of federal common law for which the U.S. Supreme Court is the final authority. In the same way that the New York Court of Appeals is the final authority for the law of negligence in accidents that occur in New York, the U.S. Supreme Court sets the rules for tort liability when the injury occurs at sea. In this case, the injuries arise from equipment that the defendants manufactured and sold to the Navy in a “bare-metal” state. The equipment would not function properly without the application of asbestos, but the manufacturers did not themselves apply the asbestos. Rather, the Navy or its agents did. The Navy appears to have sovereign immunity from this type of liability, and the asbestos manufacturers are all bankrupt. Thus, the only people from whom the sailors can hope to recover are the manufacturers of the equipment to which the Navy applied the asbestos. The trial court adopted a “bare-metal” defense, under which manufacturers cannot be liable for injuries from equipment (the asbestos insulation) that they did not make, sell or distribute. The court of appeals, by contrast, held that the manufacturers were liable if the harms from application of the asbestos were foreseeable. The Supreme Court, in an opinion by Justice Brett Kavanaugh, adopts a middle standard, under which the manufactures are liable if the product required incorporation of a part (the asbestos) and the manufacturer had reason to know that the integrated product would be dangerous for its intended uses. The court divides sharply on the question, with Justice Neil Gorsuch (joined by Justices Clarence Thomas and Samuel Alito) dissenting. 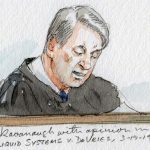 In general, the dissenters believe that the court’s “required-incorporation” standard is lacking in “meaningful roots in the common law” and also too vague for predictable application. For that group, the bare-metal defense adopted by the district court provides a better answer. 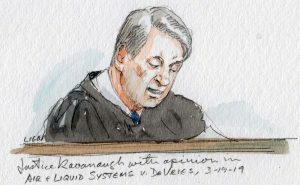 The post Opinion analysis: Justices affirm maritime liability for manufacturers of asbestos-dependent equipment appeared first on SCOTUSblog.